The print version of the International Edition of Writing With the DSM-V is available from Amazon for USD9.99. The Kindle version of the International Edition of Writing With the DSM-V is available from Amazon for USD4.99. This book, fifth in VJM Publishing’s Writing With Psychology series and released in the Summer of 2018, details how to write engaging characters who have mental illnesses listed in the Diagnostic and Statistic Manual of Mental Disorders. Mental illness is a popular subject in creative fiction – and it’s easy to get wrong. To get it right, it’s helpful to turn to the experts, such as the authors of the Diagnostic and Statistical Manual of Mental Disorders (DSM-V). This book, the 5th in the Writing With Psychology series, uses the DSM-V to help you write more accurate, believable and engaging creative fiction featuring characters with mental disorders. There are three major reasons why the subject of mental illness and mental disorder is of particular interest to an author of creative fiction. The first and most obvious reason is to provide a more dramatic portrayal. Although the subject is often treated lightly, the truth is that mental illness is one that almost all of your readers will have felt some pain from. Mental illness is common enough that anyone who doesn’t have one themselves will know someone who does. Many of your readers will have seen a life destroyed by a severe mental illness. So it’s a subject that easily engenders a strong emotive response. Mental illness is stressful, chaotic and often destructive, and all of these qualities can contribute greatly to your creative fiction. Alfred Hitchcock once described drama as “life with all the dull bits cut out”. In this book, all incidences of mental good health are cut out. 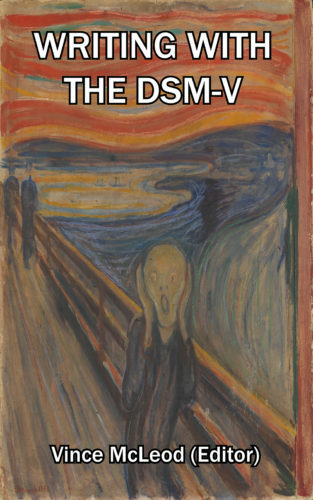 All of the conditions in the DSM-V have the potential to provide the seed for extremely dramatic fiction. A person’s life can be stopped cold by a mental illness, as surely as from having one’s legs broken. So if a character in your story develops or has one of the mental illnesses in this book, your reader will know that character is in for a hard time. Also, a story that is weak can be livened up by the introduction of a mentally disordered character, who is apt to shake things up. The second major reason is to provide a more accurate portrayal. Creative fiction is dependent on the suspension of disbelief. In order to really feel the magic of a story, the reader has to feel like the story being told is plausible enough that they can ignore the fact that they’re only reading about it and not really seeing it happen in front of their eyes. To this end, it has to be realistic. The reader will not enjoy your story if the characters in it do not behave like real people, because not only will they not believe it but they won’t be able to identify with those characters, and it’s being able to identify with those other characters that is the key to being swept away by the magic of a story. The more real the characters behave, the more the reader can let go and fall into the story world. If your story features a mentally ill character, this book will help you write them more accurately, so that the reader is more likely to become engaged in your story and thereby enjoy it. Understanding the chapter of this book relating to any mental disorder will help you portray characters with that disorder in a way that the reader will believe, or that the reader will recognise if they are familiar with the condition themselves. The third major reason is to provide a more compassionate portrayal. Key to a more compassionate portrayal of mentally ill people is a realistic portrayal of their lives. The majority of mental disorders are believed to have an origin in early childhood trauma or family dysfunction, and not from personal weakness or moral failure. So showing this is the key to getting the reader to empathise. Showing not only a mentally ill character, but also the environment and circumstances that can conspired to make them mentally ill, is an excellent way of demystifying that condition and people with that condition. After all, some mental illnesses are actually perfectly sane reactions to insane circumstances. This compassionate portrayal will help the reader like and commiserate with the characters in your story who have mental disorders. It’s easy enough to cast a mentally ill person as a villain, but casting one sympathetically requires that their background is understood. Using this book, the writer of creative fiction will be able to write excellent characters based around the conditions in the DSM-V. It’s possible to read this whole book cover to cover for ideas, or to simply choose a chapter to base a character around. Just don’t use this book to diagnose yourself or other people!